If you really want to save that top layer, choose a dense cake. Lighter, fluffier cakes tend to dry out because they have a lot of air in them, and exposure to air is what causes freezer burn. Carrot and spice cakes are probably the most accommodating to a year in the freezer, but any dense cake can make it. Also consider your filling. Egg- and dairy-based fillings will not hold up as well over time. At your wedding, have someone assigned to the task of saving the top of your cake. Telling the caterer or the serving staff, “I want to save the top layer” is not sufficient. Ask a bridesmaid, a cousin, anyone you can trust to not forget and to competently follow instructions. Have plenty of plastic wrap, aluminum foil, and two 1-gallon freezer bags. Use a permanent marker to label the bag beforehand. Some people also like to have a cake box, which should also be labeled. Of utmost importance: Make sure your assigned person knows where these things are! You might find it handy to put them in a designated bag with a printed list of instructions, just in case she (or he) forgets the process. When the reception is over, remove any flowers or other non-edible decorations from the top layer. Put the cake into the freezer for 30-45 minutes. The idea is to freeze the icing so it doesn’t make an enormous mess when the cake is wrapped. Take the cake out of the freezer. If it is on a cardboard base, remove the base. You don't want that cake to end up tasting like cardboard! Wrap the cake tightly and thoroughly in a minimum of three layers of plastic wrap. I recommend four. You can't really overdo it here. I like to rotate the cake between wrappings, just to ensure that all sides are thoroughly protected. Wrap the cake tightly with at least two layers of aluminum foil. Again, rotate the cake between each wrapping. Place the wrapped cake in a 1-gallon freezer bag. Squeeze out as much air as you can and seal the bag. Repeat with the second bag. Make sure the bag is labeled! You don't want to mistake that cake for frozen meat, and take it out of the freezer early thinking you're prepping for dinner one night. (It has happened - true story.) If you are using a box, put the bagged cake in the labeled box. That's it! Your cake is now ready to be stored in the freezer until you celebrate your first anniversary. Remove the cake from the freezer about 24 hours before you want to eat it. Unwrap it down to the plastic wrap, and thaw it in the refrigerator overnight. I recommend taking it out of the fridge and unwrapping it completely about an hour before you want to eat it. That will bring the cake to room temperature, which is typically how cakes taste best. 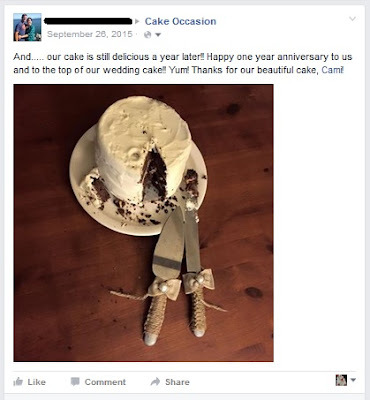 If you like the idea of the tradition, but just don’t think you can eat cake after it has been in the freezer for a year, consider this alternative: Ask your cake decorator to make a replica for you on your first anniversary. This increasingly popular option ensures you will have fresh cake to enjoy while still remembering the cake you shared on the day you said I Do. And what to do with that top tier? Serve it to guests! Or take it with you on your honeymoon (if practical). Another option is to have your designated helper freeze it for you as instructed above, but eat it when you get home from your honeymoon. So often the bride and groom really don’t get to eat the cake at their own wedding, so this is a nice option.